Omega 3 for Dogs is a concentrated blend of wild-caught, human-grade fish oil, sustainably sourced from fresh, uncontaminated waters. It contains Xtend-Life's signature fish oil blend and is a good source of omega 3 fatty acids to support the health and wellbeing of your pet. Omega 3 for Dogs contains no dairy, wheat or corn, and contains no artificial colors or flavors. Omega 3 fish oil contains two essential fatty acids: EPA (eicosapentaenoic acid) and DHA (docosahexaenoic acid). EPA and DHA are necessary for the health of our pets but are unfortunately only able to be made in a limited capacity in dogs. In order to maintain optimal health and wellness for our animal companions, DHA and EPA must be consumed through diet and/or supplementation. Omega 3 fatty acids have been extensively researched and proven to help support the health and wellbeing of your pet. Dogs often suffer from inflammatory conditions as they age, and as they are unable to produce these essential fatty acids naturally in the body, they rely on diet and supplementation to get adequate levels for good health. Studies show that most dogs are deficient in DHA and EPA and that regular supplementation of omega 3 fatty acids help manage inflammation to better maintain the health of your dog's brain, heart, eyes, joints and skin. Manage stress and hyperactivity, while naturally supporting learning ability, behaviour and overall brain function. Studies show that dogs taking omega 3 can benefit from longer lives and improved cardiovascular health. High in essential fatty acids which have been proven to help support and maintain your dog's eye health and vision. High in DHA and EPA to manage joint inflammation, support cartilage health and promote better mobility. Support a healthy immune system, reducing your dog's risk of health concerns and helping with general health. Relieve dry and itchy skin and reduce shedding, providing advanced support for a glossy, silky coat. New Zealand Fish: Wild-harvested from the pristine waters of the Southern Ocean off the coast of New Zealand which has some of the purest waters in the world. Pure concentrated Tuna oil: Processed for the highest level of purity and concentrated to meet our strict standards, this oil is molecularly distilled to further ensure your pet receives none other than the best quality oil for their needs. Choose Fish Oil, Not Plant Oil: Plant oils contain ALA (alpha-linolenic acid) which need to be converted to DHA and EPA in your dog. This makes them harder to break down and utilize and much less effective than fatty acids from fish oil. More DHA: Omega 3 for Dogs contains higher levels of DHA, plus the benefits of our unique oil blend combination, to make our fish oil superior to others. While DHA and EPA are both essential fatty acids, they play different roles and functions within the body. The key difference is that EPA relies on DHA to function adequately. Consuming more DHA ensures better all-around benefits as DHA can easily be converted to EPA in the body as it is needed. However, this is unable to happen the other way around. Xtend-Life Omega 3 For Dogs contains more DHA than most dog fish oil products on the market, providing comprehensive all-around support for the health and well-being of your dog. Tap into the power of Omega 3 with our proprietary bio-available blend containing high levels of DHA and supercharge your dog's health today. Capsules may be given whole or punctured and liquid contents squeezed onto food. 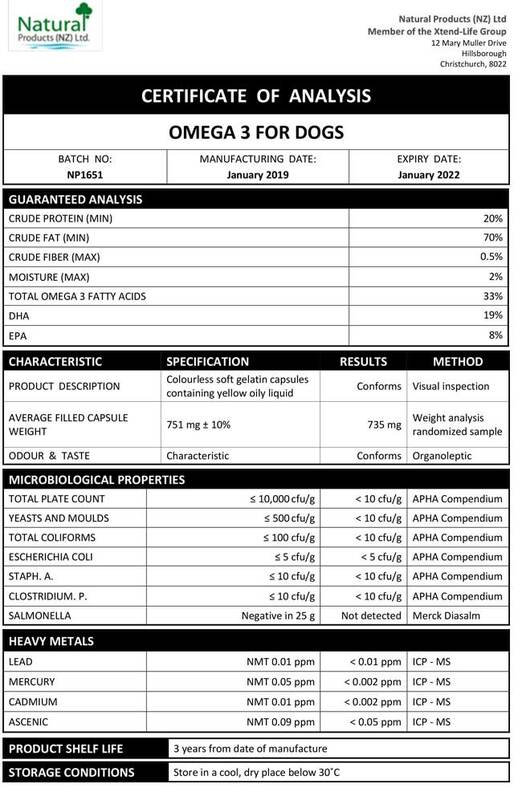 We have included below a copy of a typical Certificate of Analysis (CoA) for our Omega 3 for Dogs. You will note that there are two columns which are headed 'Specification' and 'Results' respectively. The specifications are simply our minimum standard to which each batch of Xtend-Life Omega 3 for Dogs has to conform, otherwise we would not release it. The results are the actual results from the independent laboratory that did the testing. What size is the Omega 3/DHA for Dogs soft gels? The Omega 3/DHA for Dogs is a conveniently smaller size than our regular fish oil soft gels, making it easier for dogs of a range of sizes and ages to take. The soft gels are about half the size of an industry standard fish oil capsule, at 500 milligrams per capsule as opposed to the usual 1000 milligrams. They should be easily added whole to your dogs' food and swallowed without difficulty. At what age can I start giving Omega 3/DHA for Dogs to my dog? Fish oil has a range of great benefits for your dog and the guidelines for when to begin its use are generally based on weight rather than age. As suggested, you may start giving this product to your dog once it weighs about 10 pounds or 4.5 kilograms, however, it may also be possible for you to give this to your dog if it weighs under this amount. A good method to judge when it may be an appropriate time to start giving fish oil to your puppy is once it is able to eat solid food. This will differ between breeds, but most puppies should be able to take our fish oil capsules from six months of age. Giving fish oil to your dog from this age may help to support organ growth and development, as well as encourage a healthy and shiny coat. We suggest checking with your veterinarian in order to obtain the correct dosage instructions for your puppy. Will this product help address the dry, flaky skin on my dogs' coat? Omega 3/DHA for Dogs may help to relieve areas of dry and itchy skin, as well as reduce shedding, providing advanced support for a glossy, silky appearance to your dogs' coat. This product is rich in essential fatty acids which are crucial for supporting skin health, helping to hydrate and nourish the skin from the inside. If symptoms of dry, flaky skin persist in your dog we advise seeking the advice of your veterinarian. Can I give this product to my dog if they are allergic to shellfish? As long as your dog can eat fish this product should be suitable for them to take. There is no shellfish in our Omega/3 DHA for Dogs; it is comprised of a unique and bioavailable blend of Hoki and Tuna oils. Will this product help my dogs arthritis symptoms? Omega 3/DHA for Dogs is high in DHA and EPA to help manage joint inflammation, support cartilage health and promote better mobility. It may help support arthritis-like symptoms in your dogs such as general joint stiffness and discomfort. As with any natural supplement, results will vary and occur in a gradual, subtle manner. The best support will be obtained by using this product on a long-term basis. If your dog is suffering from severe or debilitating joint concerns we strongly advise that you seek the advice of your veterinarian. How can I give Omega 3/DHA for Dogs to my dog if they will not eat the capsules whole on their food? Most dogs will happily eat the soft gels placed whole into their food. However, if your dog does not tolerate this you may pierce the gel and squeeze it onto their food, which may be especially useful in very small breeds or puppies. How pure is Xtend-Life Omega 3/DHA Fish Oil? This is one of our biggest strengths. We pride ourselves on having some of the most stringent fish oil specifications in the world and we back this up with hard data from independent government approved laboratories. Finished products are routinely tested for microbial and total heavy metal levels, as well as many in-process checks, to ensure a consistently high-quality product. What is the extraction process of Omega 3/DHA Fish Oil? Heat is used to process all concentrated, molecularly distilled oils. Our Tuna oil is supplied by one of the world's best fish oil manufacturers. This manufacturer does use heat when concentrating and purifying the oil. We chose this manufacturer because they are one of only a very small number in the world who has an extra purification step in their production process. We can confirm that heat is used briefly during production, however, this is carefully managed to avoid damage to the fish oil. We can also confirm that the oil is then rapidly cooled as it goes through this process. We cannot confirm exactly what temperature is used because this is proprietary information that relates to the supplier's unique process developed to protect the oil.